Read for This Week’s Study: Revelation 17; Jer. 51:13; Exod. 28:36-38; Rev. 13:1-8; Rev. 13:18; Rev. 16:2-12. Memory Text: “And I heard another voice from heaven saying, ‘Come out of her, my people, lest you share in her sins, and lest you receive of her plagues. For her sins have reached to heaven, and God has remembered her iniquities’” (Revelation 18:4-5, NKJV). The sixth plague causes the symbolic drying up of the Euphrates, as the disillusioned people of the world withdraw their popular support from end-time Babylon. As we saw in last week’s lesson, the shattering of her power will be preceded by extensive demonic activities counterfeiting the work of God (Rev. 16:13-14). The demonic activity will be successful in uniting the wicked in preparation for the battle of Armageddon. At the outset of the final battle, a great earthquake occurs as part of the seventh plague. The earthquake shatters the unity of Babylon and splits it into three parts (Rev. 16:18-19). End-time Babylon is portrayed as a city, signifying the short-term union of political and religious powers of the world in opposition to God’s people. This unity is shattered, causing the breakup of end-time Babylon. We must keep in mind that Revelation 16:19 only announces the political collapse of end-time Babylon. Chapters 17 and 18 tell us how this collapse actually will happen. Before describing the demise of end-time Babylon and the reasons for its fall (Rev. 17:12-18:24), Revelation 17 describes this end-time apostate religious system, this time in terms of a harlot riding a scarlet beast. In association with her daughters, the harlot Babylon, riding the scarlet beast, seduces the world against God (Rev. 17:1-11). Study this week’s lesson to prepare for Sabbath, March 23. Read Revelation 17:1. Jeremiah 51:13 shows that the “many waters” upon which Babylon sits are the river Euphrates. According to Revelation 17:15, what do many waters symbolize? A woman in the Bible is a symbol for God’s people. In Revelation, God’s true church is portrayed as a pure woman (Rev. 12:1, Rev. 22:17). A harlot thus represents a false apostate church. In Revelation 17:5, this harlot is identified as Babylon the Great. Just as ancient Babylon depended on the Euphrates River for its existence, so will end-time Babylon rely on the support of the masses to enforce her plans. Read Revelation 17:2 along with Revelation 14:8 and Revelation 18:2-3. What two groups of people are specified as being involved in an illicit relationship with, and being seduced by, end-time Babylon? The first group is the kings of the earth, the governing political powers. They are portrayed as being engaged in an adulterous relationship with the harlot Babylon. In the Old Testament, the language of fornication is used frequently to describe how apostate Israel turned away from God to false religions (Isa. 1:21, Jer. 3:1-10). The adulterous relationship between the kings of the earth and the harlot symbolizes an illicit union between end-time Babylon and the governing political powers - a union of church and state. The second group in an illicit relationship with the harlot Babylon is the inhabitants of the earth, the governed masses. These are made spiritually drunk with the wine of Babylon’s fornication. In contrast to the governing political powers, the general populace is intoxicated by Babylon’s false teachings and practices, deceived into thinking that she can protect them. When people are drunk, they do not think clearly and are controlled easily (Isa. 28:7). The whole world, with the exception of a faithful remnant, will be led astray by Babylon. In the very end, as today, and as has always been the case, the masses of the people get it wrong. What should this tell us about the dangers of following popular sentiment, no matter how popular? Read Revelation 17:3. One of the seven angels who had the seven bowls filled with the seven last plagues offers to show John the judgment of the harlot who sat on many waters. When John sees her, she is riding the scarlet beast. In what ways do the symbols of water and beast suitably describe the supporters of Babylon? As John is carried in vision into the wilderness, he sees a woman on a scarlet beast. While the harlot represents a religious entity, the beast symbolizes a political power. The picture of religion riding the secular and political powers points to two separate entities, something that was not the case in the past, when religion and politics were integrated. The prophecy shows, however, that these two entities will join together at the end time. The concept of riding a beast denotes dominance; as the rider of the scarlet beast, this end-time religious system will dominate the secular and political powers. Which characteristics of the harlot point to the dragon, the sea beast, and the beast coming out of the earth in Revelation 12 and 13? The harlot is pictured as extravagantly arrayed in purple and scarlet and adorned with ornaments of gold and precious stones and pearls; such adornment was a practice of harlots in antiquity to enhance their power of seduction (Jer. 4:30). As the color of blood, scarlet corresponds to the oppressive character of this religious system. The harlot’s dress counterfeits the attire of the high priest in the Old Testament, attire that included the colors purple, scarlet, and gold (Exod. 28:5-6). The blasphemous inscription on the harlot’s forehead also replaces the priestly inscription, “HOLINESS TO THE LORD” on the miter of the high priest (Exod. 28:36-38). The cup in her hand reminds us of the vessels of the sanctuary from which Belshazzar, king of Babylon, and his guests drank wine (Dan. 5:2-4). The cup in the harlot’s hand uses the appearance of truth to conceal the wine - the falsehoods of Satan’s end-time religious system - in order to seduce the world away from God. The harlot Babylon is further described as drunk with the blood of the saints and the martyrs of Jesus who died as a result of their witness to Christ. This bloodguiltiness links end-time Babylon to medieval apostate Christianity, which was led by the papacy and responsible for the deaths of millions of Christians who remained faithful to the gospel. The description of the harlot Babylon reflects the image of Jezebel in the church of Thyatira (Rev. 2:20-23). How do the parallels between these two women elucidate the character of end-time Babylon? Revelation 17:3 describes the scarlet beast in terms similar to the sea beast of Revelation 13, which made war with, and overcame, God’s people (Rev. 13:5-7). It was this earlier period of persecution that caused the pure woman to flee into the wilderness during the prophetic period of 1,260 days/years, from A.D. 538-1798 (Rev. 12:13-14). Though living in an age of ecumenism, Protestants would do well to remember the terrible persecution of the past because, according to prophecy, something similar, but only worse, will happen again. Read Revelation 17:8. Compare the wording of this verse with Revelation 13:8. How does Revelation 13:3 clarify the three phases of the existence and activities of the beast? (1) The beast “was”. It existed in the past. Its prior activities lasted for the prophetic period of 42 months, also known as 1,260 days/years (see Rev. 13:5 and Lesson 9, Sunday). (2) “Is not”. With its deadly wound (Rev. 13:3), the beast went into its nonexistence phase, at least, as a persecutor, in 1798. It vanished for some time from the world scene; yet it survived. (3) Finally, with the healing of the deadly wound, the beast will revive in full satanic rage. Revelation 17 describes the beast of Revelation 13:1-8 at the time of the healing of its deadly wound. Upon this revived beast, the harlot Babylon sits. Once again there will be a short-lived union of religion and politics as it existed during the Middle Ages, and persecution again will take place. “Let opposition arise, let bigotry and intolerance again bear sway, let persecution be kindled, and the half-hearted and hypocritical will waver and yield the faith; but the true Christian will stand firm as a rock, his faith stronger, his hope brighter, than in days of prosperity”. - Ellen G. White, The Great Controversy, p. 602. What warning should we take from these words about what our Christian experience needs to be now, even before final events unfold? Read Revelation 17:9-11 along with Revelation 13:18. The requirement for understanding the seven heads is a mind of wisdom. What kind of wisdom is in view here? How does one obtain this divinely imparted wisdom (James 1:5)? The angel explains that the seven heads are seven mountains. Some translators think that these mountains allude to the seven hills upon which the city of Rome is situated, and for this reason, they translate the Greek word oroi (“mountains”) as “hills”. There are seven kings, too, who are symbolized by the seven mountains. Also, these mountains are successive, not simultaneous. These mountains do not symbolize individual kings, because Revelation does not deal with individual persons but with systems. In the Bible, mountains often symbolize world powers or empires (Jer. 51:25; Ezek. 35:2, 3). In biblical prophecy “kings” represent kingdoms (see Dan. 2:37-39, Dan. 7:17). Thus, the seven mountains symbolize seven great successive empires that dominated the world throughout history, through which Satan opposed God and harmed God’s people. From John’s time perspective, five of these empires have fallen, one is, and the other has not yet come. While no single view has been agreed upon by all Adventist interpreters, many hold that the five that have fallen are the great kingdoms that in Old Testament times dominated and (on occasion) harmed God’s people: Egypt, Assyria, Babylon, Media-Persia, and Greece. The “one is” kingdom was the Roman Empire of John’s time. The seventh kingdom that “has not yet come” is the sea beast of Revelation 13 - the papacy, which dominated and harmed God’s people - that was to come after the time of John and after the fall of the pagan Roman Empire. History has powerfully attested to the truth of this prophecy, written many centuries before the events unfolded. John is further told that the scarlet beast is an eighth world power, although it is one of the seven heads (world powers). Which of the seven? Because the heads are sequential in time, the eighth must be the seventh head that received the deadly wound. It is at the time of this eighth world power that the scarlet beast appears, carrying and advancing the goals of the harlot Babylon. Today, we live at the time of the healing of the deadly wound. The eighth world power will appear on the scene right before the end and will go to perdition. Read Revelation 17:12-15 along with Revelation 16:14-16. What do you learn from the texts about the “ten kings”? Different interpretations have been offered regarding the identities of the ten kings. However, Revelation does not tell us who they are. All we can derive from the text is that they are a short-lived political confederacy appearing right before the end and supporting the harlot. Their number signifies that the world powers will render total, unwavering allegiance to the beast. Revelation 17:13-14 reiterates in a nutshell the battle of Armageddon - introduced in Revelation 16:12-16. Induced by miracle-working demonic powers in conjunction with the dragon, the sea beast, and the false prophet, the worldwide political confederacy will make war with the Lamb. In other words, the battle of Armageddon is not a military battle in the Middle East but the final conflict of the Second Coming in which Satan and his confederacy fight against Christ and His angelic host. Read Revelation 17:16-18. From what we saw in Revelation 16:2-12, what lies behind the ten kings’ change of attitude toward Babylon? Who is behind what happens to Babylon? Filled with hatred, the ten horns, which are the successor powers to the divided nations of Europe, filled with hatred, suddenly turn against the harlot Babylon (the end-time manifestation of the papacy), making her desolate and naked; they symbolically will eat her flesh and burn her with fire. In writing about what will happen to the harlot Babylon, John employs language similar to what God said would happen to adulterous Jerusalem (Jer. 4:30). Burning by fire was the punishment for a priest’s daughter who was involved in sexual immorality (Lev. 21:9). The deceived political powers have become disillusioned because of the inability of Babylon to protect them from the plagues. They feel deceived and, in hostility, attack her. This end-time apostate religious system, together with all those who choose to identify themselves with it, experiences the fullness of divine judgment. A lot of questions about end-time events still remain unanswered and, thus, can seem confusing to us now. What specific promise is given in Revelation 17:14, and what should this promise mean to us? Further Thought: Before the full moral collapse of Babylon, a voice from heaven urges God’s people still in Babylon to “Come out of her, my people” (Rev. 18:4). There are many worshipers of God who are still in Babylon for various reasons. God uses His end-time church to call these people out from this apostate religious system and not to participate in its sins. They must come out of it in order to escape its fate. God does not want anyone to perish (2 Pet. 3:9). Revelation 19:1-10 shows that many God-fearing people in Babylon will respond to the call. Think, then, about the tremendous responsibility that rests upon us as God’s remnant church. What should this responsibility tell us about our need of God’s truth in our hearts and the outpouring of the Holy Spirit in our lives? As Revelation 18:4 shows, there are many God-fearing people in Babylon whom God calls “my people”. Reflect on the following statement: “This message must be given, but while it must be given, we should be careful not to thrust and crowd and condemn those who have not the light that we have. We should not go out of our way to make hard thrusts at the Catholics. Among the Catholics there are many who are most conscientious Christians, and who walk in all the light that shines upon them, and God will work in their behalf. Those who have had great privileges and opportunities, and who have failed to improve their physical, mental, and moral powers, … are in greater danger and in greater condemnation before God than those who are in error upon doctrinal points, yet who seek to live to do good to others”. - Ellen G. White, Evangelism, p. 575. What should this thought tell us about how to treat others? 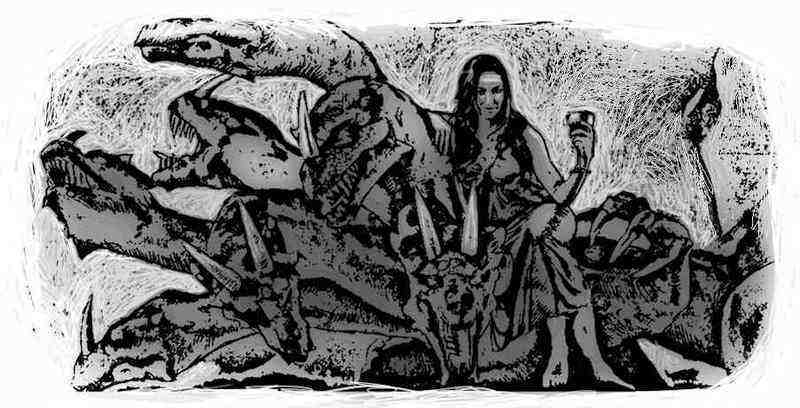 Revelation 17 describes a harlot sitting on a scarlet beast. While the woman in chapter 12 symbolizes God’s faithful church, the one in chapter 17 refers to an apostate church seducing the world away from God. In your view, what are the similarities and differences between them? More important, what can we learn from this comparison? The texts this week portray a very dismal state of the religious and political world during the final stages before Christ’s victorious return. What should this tell us about why it’s so important right now that we stay faithful, true, and pure to the message God has given us? Read Revelation 16:15, an appeal for faithfulness amid the depiction of worldwide apostasy. How can we apply this warning to ourselves right now? 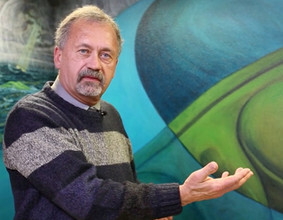 Stan Hudson’s world was turned upside-down at the age of 19 when his geology professor at the University of California announced that he believed in God. The declaration shocked the students, and they hammered him with questions. The professor turned out to be a theistic evolutionist, a person who believes that God exists but that the Earth was created through millions of years of evolution. The stance struck Stan, a budding scientist, as illogical. How could the professor put God, if He exists, in a secondary rather than primary position? Stan also was puzzled with the notion that an all-powerful God could be the source of death. Theistic evolution teaches that death was part of God’s original plan. Generations of animals had to die over millions of years to produce the creatures that inhabit the Earth today. But Stan was most upset with the realization that scientists were not as open-minded as he had thought and any scientist who questioned evolution would face a major fight. He didn’t want to fight, so he quit the university. Six months passed. One day, Stan’s roommate, David L. Friend, asked for a Bible. Stan found one in his room, blew the dust off the cover, and gave it to David to read. Seeing David reading the Bible impressed Stan, and soon he began to read it, too. The prayer, Stan later said, was probably the most powerful prayer that heaven has ever heard from him. Stan became an Adventist pastor and served for 38 years in California, Idaho, and Washington state. He never lost his love for science and has been an outspoken advocate of the biblical six-day Creation week on Hope Channel and 3ABN. He now directs the North Pacific Union Conference’s Creation Study Center in Ridgefield, Washington.